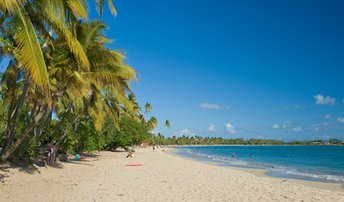 This beach ranks #5 of the "Best beaches in the Caribbean"
There are no hotels near the beach. The nearest accommodation options can be found a little to the north - in the town of Sainte Anne (room from US$70). By the way, there is a great walking pathway from Sainte Anne to the beaches of Salines, - about half an hour per way. Fly to Martinique International Airport (FDF). Next hire a taxi. The best time for a beach holiday in Grande Anse des Salines is a dry period from January to June.